The Stutz DV32 was a wonderful but temperamental piece of machinery. For a few years, a motorcycle mania interspersed my other activities. 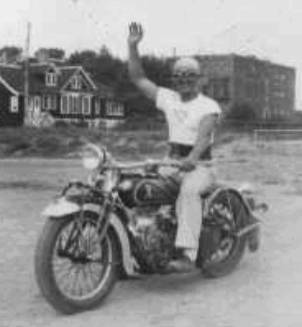 I purchased an Excelsior motorcycle and induced Edythe to drive it. At times we would ride to Coney Island and park alongside the row of cycles parked around the corner of Surf Avenue. Edythe was four months pregnant when she stopped driving motorcycles and relied on four wheel transportation. The mania for two wheel exhilarating touring diminished, but not before I experienced some associated and memorable experiences. down while I beat at my burning trousers and saw the cause of the problem. The carburetor was on fire due to a loosened gas line. A smiling Gene was trotting up as I closed the fuel line petcock before an explosion would occur. My scorched testicles created a sitting problem for many uncomfortable days..
My last motorcycle adventure was more dramatic. Before dawn I left home on my Henderson to join a group of cyclists in New Jersey. After taking the 69th Street Ferry to Staten Island, I was cruising on a winding road near Lighthouse Hill, when I heard the sound of a horn behind me. Glancing back I saw the grinning face of the driver of a Ford convertible. I waved for him to pass but he merely grinned and moved his car close to my cycle’s rear wheel. I accelerated and waved for him to pass me but he also sped up. I looked back and he was laughing at my dilemma. I realized that he was drunk or enjoyed harassing me. Ahead was a upward curve in the road lined by garden apartments. I knew I could accelerate faster than the Ford and make the curve and then find a side street to wait and let him pass me. I opened the gas intake to maximum to get away from the Ford. The Henderson seemed to leap as it accelerated and I had to lean to keep my balance in the turn. Then I heard the sharp and penetrating sound of a crash. I momentarily looked behind but the bend in the road prevented me from seeing what happened. I braked and turned the motorcycle around and went back to see a disaster. The Ford had not negotiated the turn and had crashed into the wall of a garden apartment. I idled up to the car and realized what had occurred. The Ford had what was jokingly called a banjo steering wheel, and the driver had been holding on to the steering wheel when he crashed. The thin flexing spokes that supported the steering wheel was pushed forward, and the rider’s chest was crushed by the steering column. I pushed up my goggles to see him better and I smelled alcohol and saw blood flowing from his gasping mouth. One of his hands was clutching at the bloody cavity in his chest while his staring eyes were losing their luster of life. People were opening windows to look out and a door was opening as I drove away. I did not go on my intended tour, but somewhat detached and alone, I returned to my home. At times I had the feeling of guilt that I was the cause of the driver’s death. Had I pulled off the road and stopped, the accident may not have happened. My sudden acceleration on the turn may have goaded him to speed up and try to follow me. I will never know. Not long after that event, I sold my motorcycles.